Four new drugs demonstrate that the specialty pipeline is teeming with innovation, presenting both new options for patients and some challenges for payors. This is an ongoing trend. Spending on specialty drugs doubled between 2010 and 2015, representing 70 percent of the growth during that period. The impact of specialty drugs on payor spend is likewise rising. These chronic conditions are often complex, and increasingly the same can be said of decisions about coverage. Nearly half of specialty drug spend occurs under the medical benefit. While we typically recommend managing medications under the pharmacy benefit, some recently approved, and near-term pipeline drugs are best managed under the medical benefit, given their complex administration and unique characteristics. Spinraza, a new treatment for spinal muscular atrophy (SMA), and Brineura, which targets a specific form of Batten disease, were recently approved by the U.S. Food and Drug Administration (FDA). Tisagenlecleucel-T (also called CTL019) and axicabtagene ciloleucel (also known as KTEC19) are personalized therapeutic cancer treatments pending FDA approval. All four are complex and costly drugs that warrant special attention. Spinraza (nusinersen) is the first drug approved to treat SMA, a rare, often fatal disease characterized by progressive muscle weakness and wasting. Spinraza is administered intrathecally — directly into the cerebrospinal fluid surrounding the spinal cord. It is also recommended that the patient be sedated, making it likely that the drug would usually be administered in a hospital or surgical center. It is most appropriately managed under the medical benefit. Spinraza is priced at $750,000 for the first year and about half that for each subsequent year of therapy. It will not be covered under the pharmacy benefit, unless a client requests otherwise. Brineura (cerliponase alfa) is the first approved treatment to slow the loss of walking ability in children who suffer from a form of Batten disease, a rare, genetic condition. Patients with this neurological disease typically do not survive past their teens. Brineura is administered every other week into the cerebrospinal fluid via a surgically implanted catheter and reservoir in the head (a process known as intraventricular administration). The procedure takes about 4.5 hours and must be done under sterile conditions. The treatment costs about $702,000 annually. Because of the intraventricular route of administration, this treatment would most often be administered at a hospital or surgical center. It is most appropriately managed under the medical benefit. Tisagenlecleucel-T, a drug to treat pediatric and young adult patients with a specific form of acute lymphoblastic leukemia, and Axicabtagene ciloleucel, for the treatment of an aggressive type of non-Hodgkin lymphoma, are both pending FDA approval. Both therapies are manufactured by removing the patients’ own white blood cells (T-cells), genetically engineering them outside the body, and then re-introducing the modified cells to the patient as a one-time intravenous (IV) infusion. This technology is known as chimeric antigen receptor T-cell therapy, or CAR T-cell therapy. It is anticipated treatment will be administered in the hospital under medical supervision because of the personalized nature of the medications, logistics, and potential for adverse events. It is expected that both therapies would be reserved for patients who have exhausted other treatment options. Both drugs have been granted Breakthrough Therapy Designation and are expected to carry a price tag of $300,000 to $500,000 per infusion. Even though many of these drugs cover small patient populations, they could have an impact on costs given their significant launch prices. 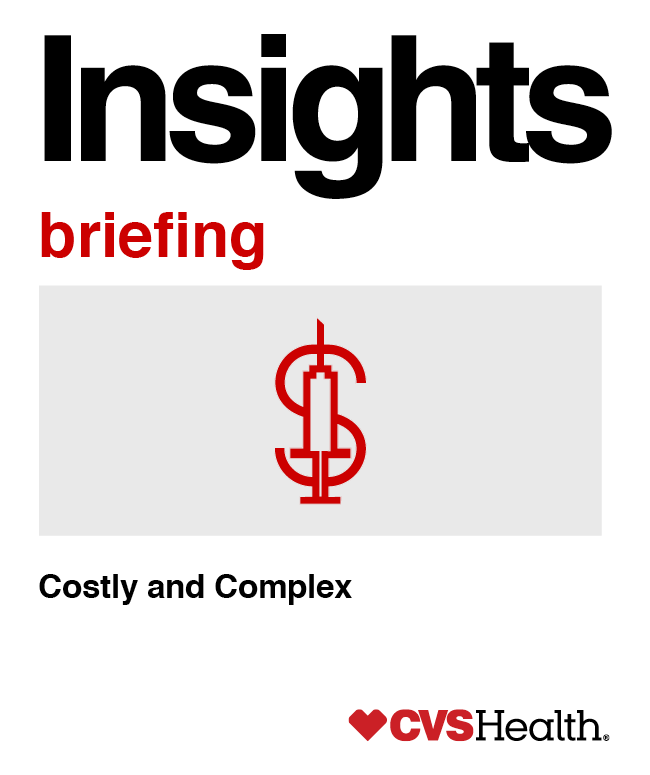 Payors should carefully consider all cost management options available to them within the medical benefit to effectively manage spend. Payors may also want to evaluate their benefit plan materials to ensure that coverage of these types of drugs is appropriately addressed. At CVS Health, we closely monitor and evaluate the specialty pipeline, so we can make proactive recommendations to help mitigate the trend impact from drugs to treat complex, chronic conditions. As we look to help control costs while improving outcomes, we will continue to provide updates on the rapidly evolving specialty pipeline. *For clients utilizing Novologix for medical PA or clients for whom the CVS Caremark SGM team currently reviews drugs for payment under the medical benefit, SGM criteria will be utilized.